Completed in 2006, the new Duke of York Square complex is built on the site of the former Royal Military Asylum, which was known as Duke of York's after the Duke who laid the foundation stone in 1801. The Asylum later became a teacher training school and then the headquarters of the Territorial Army, which had a large parade ground fronting the main building. In 1999 the Ministry of Defence offered the site for sale and it was subsequently purchased by the Cadogan Estate for development for retail, residential and commercial uses together with provision of new public open spaces. The Royal Military Asylum for the Children of the Soldiers of the Regular Army was built on land leased from the Cadogan family in 1801, which was once the site of the family's residence, Chelsea House, demolished sometime before 1801. The Asylum was built to provide a home for children of soldiers' widows, and it was designed by architect John Sanders, who built Sandhurst. It became known as Duke of York's after the Duke who laid the foundation stone in 1801. The Chapel, consecrated in 1824, is located at the corner of Cheltenham Terrace. The Asylum later became a teacher training school and then the headquarters of the Territorial Army. In 1953/4 further buildings were added, designed by Harold Dicksee. In 1999 the Ministry of Defence offered the 10.5 acre site for sale and it was subsequently purchased by the Cadogan Estate for development for retail, residential and commercial use and for new public open spaces. The scheme architects were Paul Davis & Partners. The site includes the former parade ground overlooked by the Palladian TA Headquarters buildings, which remains a large grass area with perimeter trees. It was once the running track where Chris Chataway and Roger Bannister trained. 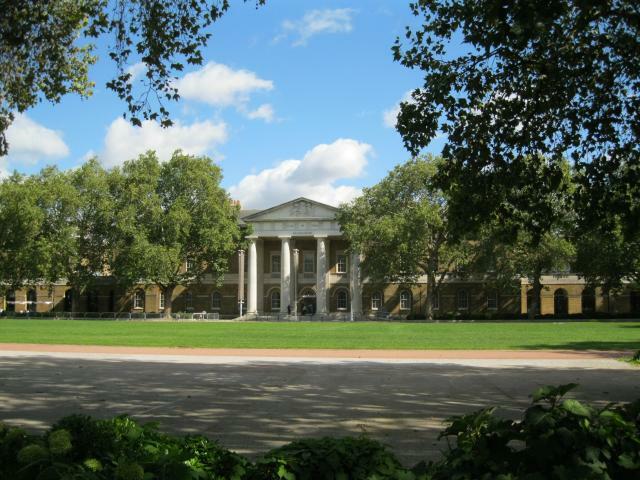 This large expanse of green, once hidden behind walls, is now visible from King's Road and from the Saatchi Gallery, which has opened in the former Royal Military Asylum. The new Duke of York Square was landscaped by Elizabeth Banks Associates, who won the competition to design the hard and soft landscape for the new quarter including the new public square. Their design concept was outlined as follows: 'Natural stone, timber, planting, water and light are used to create a series of vibrant, animated but flexible spaces for sitting and informal recreation, as well as market stalls and events. Litter bins and lights are incorporated into the seating elements to reduce the visual clutter. The paving is set out as a grid of York stone, which relates to the building modules. Access covers were designed to fit within the paving grid. Long stone and timber elements cut diagonally across the grid, taking the form of seats, low walls and strips of paving. Clusters of fountain jets set into paving add sound and movement. Lighting reinforces the design and add drama at night. The paving is softened with gravel and planting behind the listed wall and pin oaks are planted throughout the site. References to the site's history and context appear in various forms'. A statue of Sir Hans Sloane (1660-1753) was erected in the new Duke of York Square in 2007, outside the entrance gate to the Saatchi Gallery, a copy of the C18th statue once in the Chelsea Physic Garden, the original now in the British Museum.